Trying to make any Auburn connection we can with the new breed of Television Is Better Than Movies shows out there is one of TWER’s many pet projects. We’ve got Mad Men covered, as covered as we can—tying in an old ad in the Plainsman with the episode with Peggy and The Relaxercisor was one of our first posts, and we’ve got the Auburn grad who dresses up like Joan, and of course we know that Don Draper is an Auburn Man. As for the rest, we’ve lacked woefully… until—thanks to Christi Parrish—today. Had we done more digging, we actually could have started feeling better about ourselves along these lines on Oct. 30, 2011. 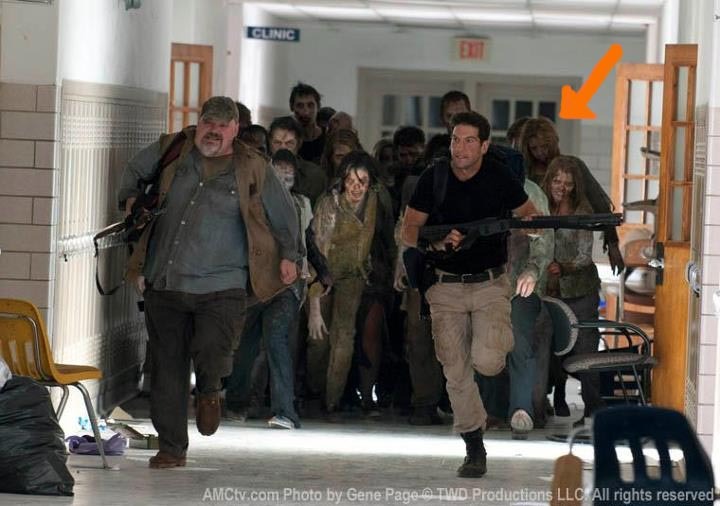 That’s when the third episode of season two of AMC’s critically-acclaimed zombie thriller The Walking Dead aired. Parrish, who graduated from Auburn in May 2011 with a Degree in Public Relations, was an undead extra. Parrish spent three hours in makeup. She wasn’t supposed to take a picture of herself as a zombie. Things happen. She got a call the next day. “They said they needed a few more zombies and said ‘can you be here,” she says. “Here” was a hot high school in Newnan, Ga. Her scene took 16 hours to shoot. She’s on the screen for just 30 seconds, stumbling around under the burden of three hours worth of makeup and two dark secrets. The first? She was uneducated. But the worst secret of all? 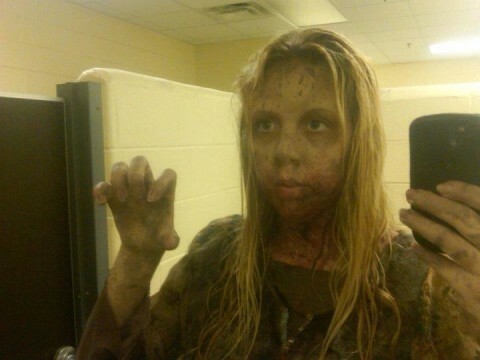 She’s also upped her zombie game. 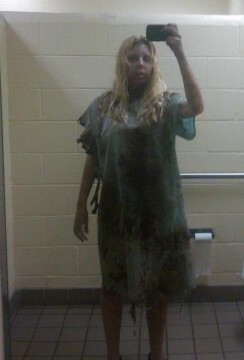 She and her boyfriend, Elliott Chenger, regularly participate in zombie-themed events in Nashville. They were even voted into the prom court at the 2011 Promocalypse. That’s pretty die-hard, as it were. And thanks to her 15 minutes of undead fame, her dark-alley cred is impeccable. However, Chenger, who’s also an Auburn grad, couldn’t pass the physical. Being 6″4 and 250 pounds is great for a hockey player—Chenger and Parrish are responsible for resurrecting Auburn’s hockey team from a 28-year hiatus (Auburn had a hockey team from 1979-82)—but apparently not for a zombie. Pfft, there was an Auburn grad (and her dad was a French professor here) as an extra in the very first episode of the Walking Dead. You guys just need more contacts in the biz.